The Backwaters Press, 9781935218395, 84pp. This new collection by Nebraska poet Marjorie Saiser explores the notion of witnessing. Particularly in our technological age, when we have access to international news as it happens, the question comes up: what responsibility do individuals—including those living in relatively quiet middle America—have in regard to world events? 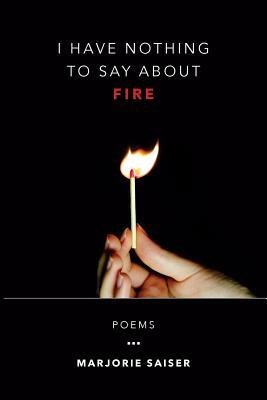 The poems in I Have Nothing to Say about Fire reference autobiographical elements: marriage, children, parents, in-laws, etc., but they also reference global tragedy: war, terrorism, genocide. As we experience our own personal losses and triumphs, what relationships should we strive for with family, friends, neighbors, and the strangers around us, particularly as their narratives push them forward into our and/or the public’s consciousness? In this book, Marjorie Saiser explores these essential questions and offers potential answers that may help all of us. I HAVE NOTHING TO SAY ABOUT FIRE is Marjorie Saiser's fifth full-length book of poems. She co-edited Road Trip (The Backwaters Press, 2003), which features interviews with writers who teach, and she also co-edited Times of Sorrow / Times of Grace (The Backwaters Press, 2002), a collection of prose and poetry by women of the Great Plains. Saiser's awards include the WILLA Award for Poetry in 2014, four Nebraska Book Awards, the Nebraska Literary Heritage Award, an Academy of American Poets Award, the Vreeland Award, and the Leo Love Award. She was named Distinguished Artist in Poetry by the Nebraska Arts Council in 2009. Saiser's poems have been published in the anthologies Women Write Resistance and The Untidy Season as well as in American Life in Poetry, The Writer's Almanac, Prairie Schooner, The Georgia Review, Nimrod, Rattle, The Chattahoochee Review, Cream City Review, Smartish Pace, burntdistrict, RHINO, The Fourth River, Field, and Cimarron Review.